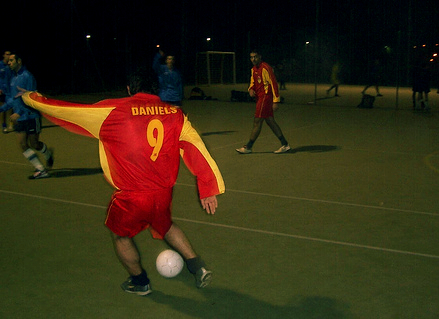 The 5-a-side free kick is a different beast to the 11-a-side version. A lot of your options are wiped out, you’re rarely going to get the opportunity to send one dipping over the wall Gareth Bale / Cristiano Ronaldo style, and you haven’t got the distance or the size of goal to consider bending it like Beckham. So what are your choices? The most straightforward technique is obviously just to shoot directly, but before doing so you’ll want to check that it’s a direct free-kick. We’ve seen dozens of instances where a player has blasted it into the net from a free-kick and started to wheel away in celebration, only to be told that it doesn’t count. Don’t make that mistake. Now, that’s not to say that you can’t shoot from an indirect free-kick. We’ve seen players power it towards goal hoping that it will clip a defender or the goalkeeper’s glove and go in – an idea to consider, though maybe not your first choice. If you’ve got a clear strike at goal and it’s within range, take it. You’ve got two options – either blast it and go for power, or try to place it (although you’ll still need a fair amount of power for this too). You don’t have to blast it, it’s perfectly possible to score with a side-foot. If you’ve got a clear view at goal and you’re within range, shoot! The difficulty of shooting directly is that if the opposition team puts two in the wall then, since they don’t have to be more than a couple of paces away, it’s not always possible to get a good sight at the target and your shot stands a high chance of being blocked. In that case you might need to try something different. The only problem with moving the ball on to a teammate is that there’s a fair bit of extra complication, which requires extra technique in its execution. It’s a lot harder to strike a moving ball than it is a stationary one. Especially when the ball is moving across your body, as it’s a really unnatural movement, which makes it difficult to get a clean strike on the ball in the direction of your choice. The other thing that you’ll need to bear in mind is that the moment player 1 kicks the ball, the opposition are going to start swarming around to close down the shot. Now, if the second player doesn’t have nerves of steel and rather large ‘cojones’ then this is probably going to be quite off-putting, and their technique is likely to suffer. With the opposition players bounding rampantly towards you it might feel like a scene from Zulu as you try to load your musket in the face of the onrushing warriors. So if the thought of getting your shot on goal under this pressure has you sweating more than Josef Fritzl on an episode of MTV Cribs then the role of ‘shooter’ isn’t for you. The beauty of this type of free-kick routine is that it can get ever more complicated, although do remember that you might need to have discussed a couple of these combinations first, otherwise it’s going to be difficult to execute. But these types of free-kicks do come off in real games, and the possibilities are really only restricted by the imagination. If you’ve ever seen a magician then you’re likely to have been a victim of this. It’s their stock in trade – it’s the sort of thing that gets you looking at their bendy wand (make your own jokes up there folks), whilst they fumble about pulling a rabbit out of a hat. The same sort of thing applies to taking a free-kick. If you can distract the opposition slightly, or send them the wrong way, then you’ll make it just a little bit easier for the person taking the kick. This can be done in so many ways, but we suggest you don’t get your ‘bendy wand’ out, as that sort of thing is frowned upon. Have one player off the ball running as if you’ll pass to them for the shot, before sending it to a different player altogether. Technique is the key to performing free-kicks successfully on a regular basis. Whether you lace-it, curl it, pass-it or anything else, you’ll need to do it well, and you’ll need to do it under pressure. Remember, being able to hit a ball with no wall in front of you is far removed from trying to strike the same shot in a game, with a wall in front of you. And if the simpler free-kicks require a lot of technique and composure then the complex things require even more! Don’t underestimate how tough it is to cleanly strike a moving ball on target. So there it is, our guide to free-kicks for small-sided games. Hope this leads to some amazing goals being scored – let us know if you’ve got a favorite free-kick in the comments below. The Argentina Freekick is funny yet effective! Btw, cool article, very detailed. Cheers Martin. Glad you enjoyed it. Brilliant! Loved the first bit of misdirection. Given the space involved, direct free kick strikes on goal are tough, as a team would be a little stupid not placing some kind of wall in the way. 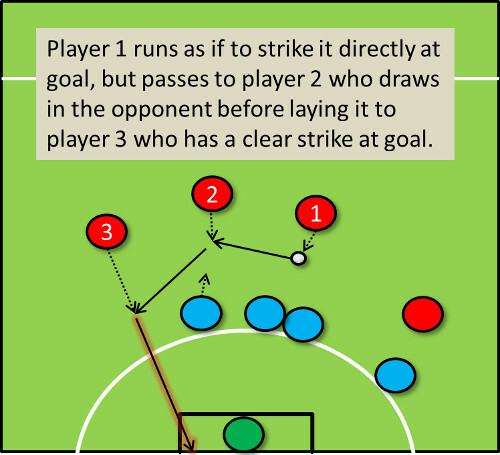 Any kind of pass for a strike by a second player is going to be tough too, as the defending team should be able to cover the space to close down easily. In my experience, you don’t see a lot of goals scored from free kicks, but that is probably a reflection ofthe teams I’ve played in. Great article though. Cheers for the comment. Yep, it certainly is tricky to get these right, and goals from free kicks can become a bit like collector’s items. But I always think that, as you say, they’d be mad not to put 2 men in the wall, leaving you instantly with an unmarked player and the chance to work something. Actually doing that is very difficult, but possible! Also, let us know when your site is up – sounds interesting!